A Kubota L1-R24 in its rearward operating configuration. 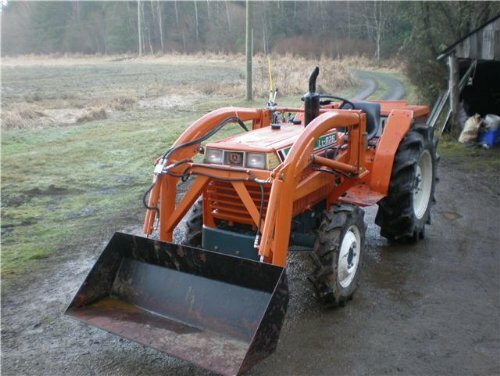 We recently received a comment from Ian King, an OrangeTractorTalks reader from British Columbia, Canada (map), asking for some information on his recently acquired Kubota L1-R26 tractor. Unable to find much, if any information on it, Mr. K and I decided to answer some of Ian’s questions with a feature story on his unique Kubota! Ian's Kubota L1-R26 in the forward configuration with a front end loader ready to do some work. You have to hand it to the average hard working farmer – masters of ingenuity, dreamers and developers, they have come up with some of the most creative ways to get things done, make things work, or repurpose old machinery for a new task. It is this line of thinking that gave birth to the bidirectional tractor. In the late 1960s, a couple of talented brothers, Peter and Dan Pakosh from Manitoba, Canada (map), were building grain augers, drawbars and field sprayers under their own brand name, Versatile. 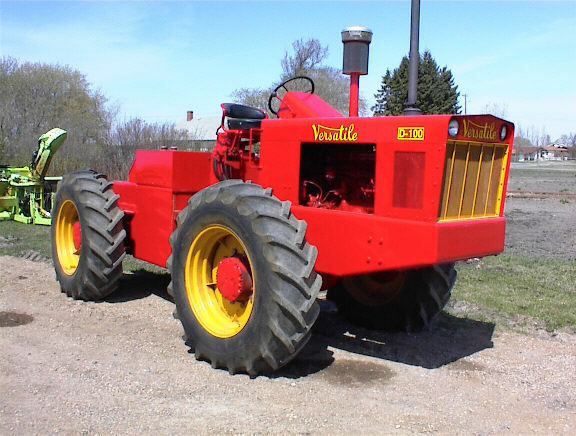 Credited with being the first company to mass produce 4WD farm tractors, brother Dan thought that a market existed for a multipurpose tractor that could be operated bidirectionally. Surely the world was ready for such an innovation! The D100, the world's first mass-produced 4WD farm tractor. Produced by Versatile in 1965. Since the tractor could be used to either push or pull an implement, it was marketed as being “a number of self-propelled machines in one”. The concept was an immediate success. With 4WD and a switchable operator’s platform, bidirectional tractors had arrived! 20 years later, when was Versatile sold to Ford-New Holland, the design engineers at New Holland brought Dan Pakosh out of retirement to help them modernize the bidirectional tractor, taking it forward into the next century. The result was the New Holland TV-140. The Ford-New Holland TV-140 - a result of redesigning and bringing the bidirectional tractor into the 20th century. Peter Pakosh goes to work for Massey Harris honing his skills as a designer, draftsman and inventor. Peter and his brother Dan become the first to mass produce a 4WD farm tractor, the Versatile D100. New Holland buys Versatile and starts developing the next generational of bidirectional tractors – the New Holland TV 140. Kubota brings out their own line of bidirectional tractors, the L1-R Series. 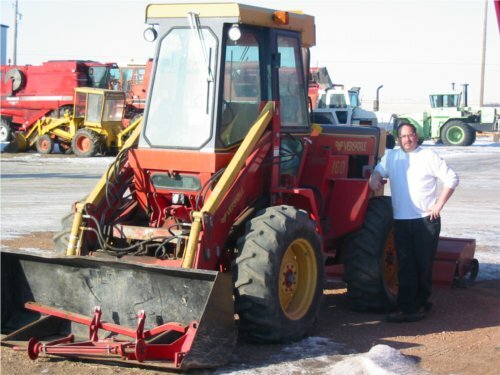 Service Department Vic standing beside a Versatile 160 bidirectional tractor. Versatile built the 160 from 1982-1983. Ian’s L1-R26 is equipped with a Kubota V1512 direct injected 4 cylinder engine. 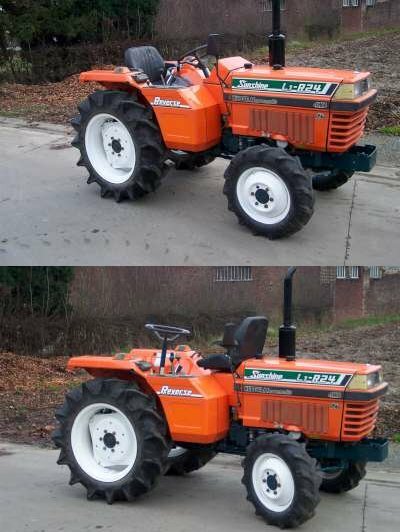 The V1512 was used in a number of JDM Kubota tractor models including the L1-265, L1-285, L1-295, L1-315 and was also used in the L1-R28. Depending on injector pump pressure and timing, the V1512 was rated anywhere from 26-32 horsepower at the PTO. Transmissions and final drives are shared on Ian’s Kubota with the Kubota L2250, L2550, L2650 and L2950. While these North American models had 4 ranges and 4 working speeds to the transmission (16F), the JDM versions offered 20F speeds. Both the Japanese Domestic Market and North American models feature a mechanical shuttle shift. All L1-R’s have 4 speed PTOs which operate at these speeds (@ 2500 engine RPM): 566 RPM, 774 RPM, 938 RPM and 1250 RPM. Interestingly, all L and L-1 gray models have 4 speed PTOs and gray market B series have 3 speed PTOs. For North American models (non gray market equipment), Kubota limited the PTO to only 2 speeds. 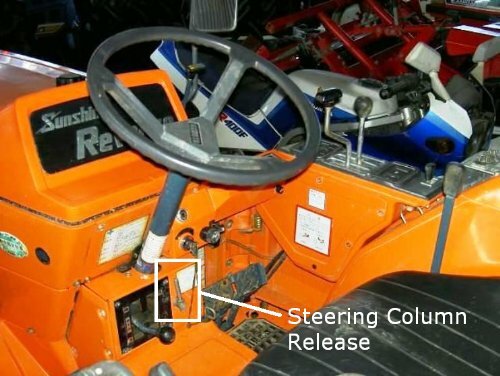 The steering column is detached from its location by unscrewing a set bolt located adjacent to the PTO speed change lever. Steering wheel release located next to the PTO speed lever. The dash blank out panel is unclipped and stowed. When switching to the reverse configuration, this blank out panel is removed and the seat is installed in its place. The seat is released and mounted where the dash blank out panel was removed. Note that because of the placement of the speed change lever and shuttle shift, control of the tractor is still natural feeling in either forward or reverse configurations. A close up of the L1-R shuttle shift - its placement means operating the tractor is not awkward regardless of forward or reverse configuration. 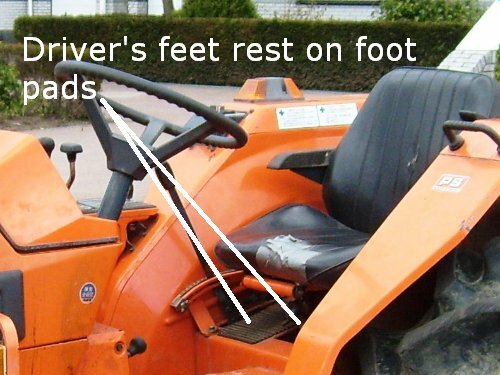 When operated in the reverse position, the driver’s feet would rest on foot pads, one located on the right hand side of the seat by the position control, and the other rubber foot pad on the center of the transmission tunnel where the transmission is filled. Driver's feet rest on foot pads that are normally under the seat. 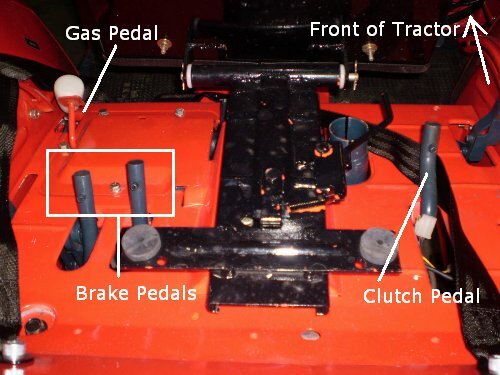 The brake and clutch pedal pads are connected with bolts on Kubota’s Reversing L-1 tractors, rather than welded on as they are on the L1-18, 20 etc. For reward operation, these pads are removed and are installed on redundant pedal “posts” that are located on either side of the operator’s seat. A complete set of duplicate pedals – gas, brake and clutch are sitting under the seat! The steering column is reinstalled where the seat used to be. The final detail would be to swap the tires from side to side in order to maximize the traction of the R-1 Ag Grips. An L1-R24 before and after swapping from forward to reverse operation. Cab versions of L1-R Series Kubotas were equipped with front and rear windshield wipers, and in addition to having lots of glass, the cab versions had a glass window that was at the back of the tractor behind the seat. An L1-R Kubota equipped with a cab - note the rear glass panel for viewing ground near the PTO and the rear wiper. Non-cab versions had a plexiglass panel just behind the seat which incidentally, had two armrests rather than a single armrest seat version installed on non-Reverse models. This opening made viewing the ground right at the 3 point hitch possible when operating in the rearward facing position. What were these Tractors Used For? Anywhere that increased maneuverability and tight handling were needed, the L1-R Kubotas were pressed into use! You can see from these videos that show the L1-R Kubota in action (thanks to OrangeTractorTalks reader Dan Alex for finding them and forwarding them onto us). There you have it, a history and overview of a rare and unique Kubota. If you have more detailed questions or comments regarding the L1-R series, ask away in the comments below and we’ll do our best to answer. Really interesting to learn something about this interesting Tractor. Hello! I’m from Romania and I have a Kubota ZL1-R26. Thank You for the info onthis tractor! It is very useful since I didn’t knew too much about this model. Mine looks and starts good and I’m very happy with it. If you have questions for me I’m available! Hello Dan – all the way from Romania! Looks like we are getting quite the international fan base! Happy to help out. Be sure to check out our forums too! I’ve owned a L1-26R for the last 7 years and have had no problems with it other than being able to find out some more information about this model until I read your article. The article filled in a lot of background information for me, but also gave me a source to ask some further questions about this tractor, so I’m hoping you might have the answers. 2. I’ve been told that the L2850 is the closest North American model for getting parts is this true. 3. Do you have any further pictures of the cab shown in the article, would sure like to build something similar. 4. Do you know of a supplier who might be able to get parts for the transmission controls on this model. 5. How hard would it be to add external hydraulics to this unit. Your tractor shares alot of parts with the North American L2850, and if you need transmission controls, they will have to come directly from Japan. Let me know what you’re looking for and I’ll see what’s available. Freight is a killer, unless you’re buying a 40′ container load of controls! Sorry, the picture of the cab was the only one we were able to locate when compiling the information on the L1-R Series Kubota tractors. Adding external hydraulics is pretty straight forward on that L1-R26. You may find a factory “port” from which to plumb and aux valve somewhere under the seat pan. If you’re not surewhat that port would look like, then if your tractor has a loader, you can “T” off a hydraulic line on the pressure side or hook into the Power beyond port on the control valve to power a hydraulic port at the back of the tractor. I wonder if using the tractor in the reverse for a long time and an intense use would damage the shaft(or shafts) or gears in the reverser of the gearbox. Thank’s for the info Service Dept Vic! Nope! Reverse away all you L1-R owners!! Vic, it is good that you are doing this great job. I am based in Tanzania – East Africa. I am in a process of getting two used tractors from Japan, Kubota L1-275 4WD and Kubota L1-255 4WD. 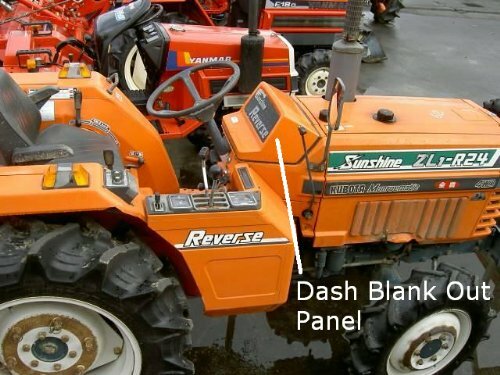 Information from the selling company is that these tractors are 27HP and 25HP respectively, . I want to use these tractors to pull disc plough and disc harrow. The selling company is selling together with rotary tillers. 1) When did these tractors come into the market for the first time? 2) Is Kubota company still manufacturing these tractors? 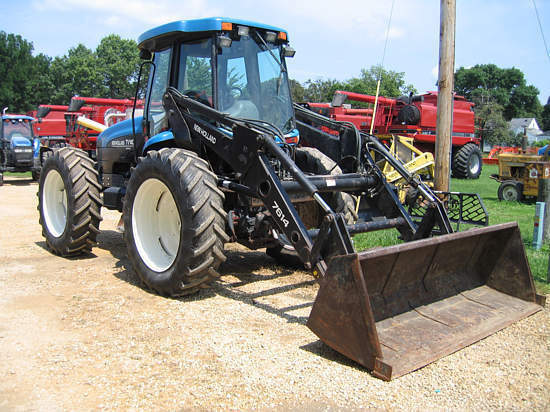 3) In terms of parts, which other tractors are compartible with these tractors? 4) Are these tractors real capable of performing the job I need to do? 5) On average, what size (acres) these tractors can cultivate in a day? 6) How continuous these tractors can safely be operated? 7) How durable are they? 8) I am a small farmer owing 500 acres oranges, I am looking at a cheap equipment but reliable that have low operating cost, do you think to buy these tractors is a right decision? 9) Few people I consulted informed me a tractor less than 50HP will not be capable to pull a plough especially when working in slightly hilly and heavy soils, is that true? Hello Bart! I’m not the most authorised person to answer your questions but i’ll try to guide you. I saw a 12 HP tractor ploughing with a single furrow on hills hith heavy soils so I bough a Kubota with 26 HP at the PTO with a two furrow plough. I used it on impossible terrains and hills so I can say that you can plough with a small tractor too. But in your case it would be dificult to take care of 500 acres with a small tractor. Even with two i think it would be hard. Why disc plough and disc harrow. The tiller is not working? Try the forum. You’ll have more answers there. Bart, You do not have enough “Kubota” to work that 500 acres, so I agree with Dan Alex, you need more tractor! 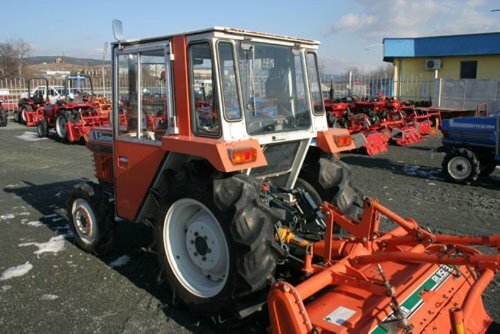 A Kubota would be an excellent choice for your farming operation, however any units exported from Japan are all going to be considerably smaller in stature and HP than what you need. Look for something in the 60-75HP range MINIMUM for tillage work! Great find Dan! I’m going to include that video in the article. Well done! We have those tires here but you should be able to get them locally as well through Bridgestone-Firestone, Cheng Sing or other off shore builders also have that very common front wheel assist tire available. Are you totally without a supplier in yourt locale? 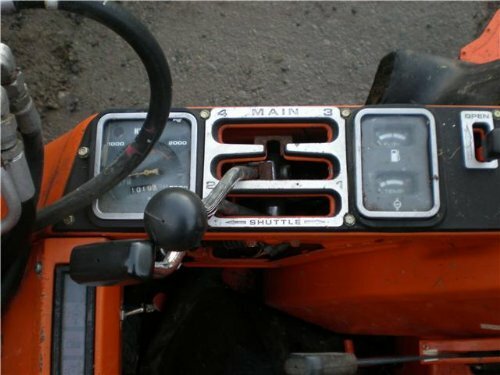 Does any know how I could get a repair manual for a 1988 Kubota L2850? Those I’ve found online are quite pricey. I have an L1-435 and I am chasing a manual or the model number of a similiar tractor available in Australia so that I can do some servicing etc. Any help would be appreciated. 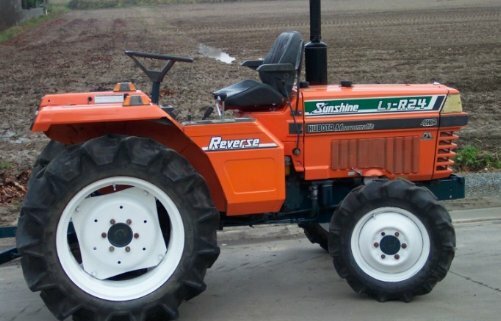 I BOUGHT A KUBOTA L1 255 REVERSE, AND I WANT TO BUY A SERVICE MANUAL WITH INFORMATION OF THE ENGINE, ELECTRICALS, COMPONENTS, e.t.c OF THIS TRACTOR. WOULD YOU PLS INFORM ME WHERE CAN I BUY IT?